So here we are, just hours after the “Fight Of The Century” and the world has a bitter taste in its mouth. Not because the “people’s champ” failed to come up with the goods, or because the “pantomime villain” got away with his usual antics; but because the one fight that could have rekindled the general public’s interest in boxing, ended up steering more potential fans away than ever before. Make no bones about it. Even the most die-hard boxing fan would struggle to agree that last night’s main event (or its atrocious undercard) was in any way, shape or form entertaining. Floyd’s absolute mastery of the craft unfortunately doesn’t translate into fun viewing. 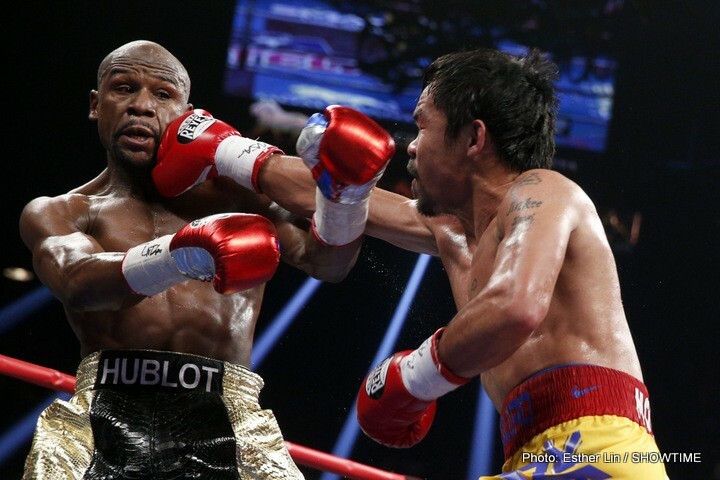 Pacquiao failed to find any momentum, and as predicted, spent most of the uneventful rounds chasing shadows. Such is the level of Mayweather’s game. He makes his opponents look nothing more than ordinary whilst he wins rounds without the need to throw many punches. Sure, his infrequent, stinging counters are beautiful to behold for true boxing enthusiasts, but the “fight” never actually becomes a fight and now, on its biggest ever stage, boxing has blown all chances of drawing in millions of new fans and outdoing MMA in the popularity stakes. Those people that always say to me “boxing’s not like it was”, “it doesn’t have enough action these days” and “I remember you used to hear about it a lot more, now it’s not that big”…..I have no answer to defend the sport anymore. A few years ago, I penned an article for ESB titled “The Decline Of The Superfight,” which was a cynical dissection of superfights generally failing to live up to the stratospheric heights they set for themselves. That was in direct reference to the terrible Klitschko – Haye debacle that had a huge public profile, yet ended up turned more fans away. Klitschko runs many parallels to Floyd Mayweather Jr. Much derided for his “boring” style, yet happy to continue using it as it keeps him winning fights, most people who don’t follow the sport that watch a Klitschko or Mayweather fight will most likely not bother tuning in to watch boxing again. Comments that litter the internet this morning are telling: “Thanks Floyd, I’ve just spent another wad of cash on watching you do the same thing you’ve done for the last 17 years. I guess I’m the fool here.” Or “can someone please change the rules of boxing so that you actually have to throw punches to win?” Pacquiao caught flak with scathing comments such as “the Filipino typhoon is more like a storm in a tea cup” and there were many along the lines of “someone wake me when the fight starts” (during the match itself it would seem). A reflection of the sour taste people have today. Many cases of this are due to people tuning in to see Floyd lose and coming away disappointed that it wasn’t even close. Most however will be due to the fact that another massive “superfight” turned out to be a dud. There’s no way to discredit Floyd Mayweather’s out-and-out greatness. For true boxing aficionados he must certainly now rank among the sport’s all time elites. I used to count myself amongst those true enthusiasts, now with father time and general life making it increasingly harder to dedicate the time to boxing that I’d like, when I do fork with my hard earned cash and give up the Sunday with my family to stay up and watch a fight, I want to be entertained above all else. As many people predicted from the outset, it was far from entertaining. For the Pac-man now, there is surely no other choice besides retirement. He gave us many memorable fights. Sadly, the fight he will be most remembered for was his most one-sided loss (not counting the brutal KO he suffered at the hands of Marquez). And Mayweather? With one fight left in his Showtime contract, and nothing to prove at 147 or below, if he truly wanted to give us a memorable final fight then a jump to 154 or 160 against a champion there would be a great way to finish his remarkable (yet largely unexciting) career. Boxing has just reached the end of an era.